Designed to give your hair voluptuous style, the BaByliss Pro Ionic Airstyler boasts unique features to give a salon perfect, frizz free finish every time. 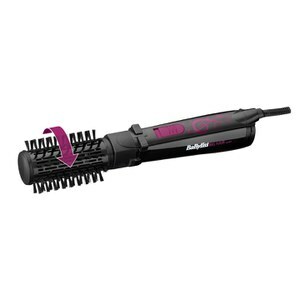 With a powerful 800W motor, a ceramic coated barrel and salon length cord, the Airstyler can create shapes and curls in your locks which last all day and night. The 3 speed settings allow you to gage that perfect temperature to achieve a sleek style, whilst this 34mm barrel has been created specifically for mid to short styles. K.D. I bought this as a replacement for the old BaByliss blue model. While I agree that it is very loud and the controls are small/fiddly, generally I am quite happy with it. It is relatively inexpensive and dries my hair nicely, as the old model did. 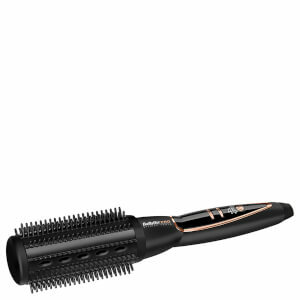 It seems to have shorter bristles than the old model however and I think if you have thick hair, drying your hair with this product would be very time consuming, which would rather negate its point. Love this hot air brush. i have been looking for a replacement for my trusty old Babyliss blue lightening, have been looking everywhere thanks look fantastic. Only one comment which is only a little thing, the on offf switch is a little small and a bit fiddly, the rest is super and more power than my old one. Very good divice. Would be worth 5, but is not without changes , usable in Finland. This does exactly what I wanted. My hair isn't very long but it is is a bit unruly and this airbrush gives my hair a modern sleek look with bounce rather than straight - which I don't suit. I love it and would highly recommend - in fact I did - my sister bought one too.. I bought this styler to replace an older model of the same Brand, which, after many happy years of usage, has stopped working. Sadly, the new model is not as good. The negatives: It's noisier, the fan blows at the same speed regardless of setting (the old model's fan was gentler on a lower heat setting); it's lighter which means it's made out of more plastic parts, the bristles are already bent and my fine hair gets tangled in them all the time, it doesn't smooth the hair (as an ionic product would), the control buttons are difficult to use, the "cool tip" is not cool at all. Positives: it's lighter (easier to hold), the cable is longer, If I could, I would return it. Does its job, although the brush got stuck in my hair when brushing all the way up to the root. I have very long and fine hair. More of a finishing styler for me. Excellent product. I use it daily on damp or dry hair. Easy to use. I wouldn't be without it. I bought this Airstyler to replace one I had used for several years. My hair is fine and is a chin length bob. This product has transformed my hair. It is now full of volume, has a lovely shine and behaves better in bad weather. I love it and all at a very reasonable price.